Crispy, gooey and super nutty, classic Chinese sesame balls are a delectable treat not to be missed. They taste even better when made from sweet potato. Sesame balls (Jian Dui, 煎堆 or Ma Tuan, 麻团) are a type of fried Chinese pasty snack popular in many regions of China. They are sweetened glutinous rice balls covered with sesame seeds, deep fried to a crispy texture outside with a gooey inside. I often alter the classic recipe of this delightful treat by using cooked sweet potato as the main ingredient. There are many ways to cook sweet potatoes. My favourite way is to bake them whole in the oven. It’s time-consuming but it somehow adds creaminess and a slightly smoky flavour which I adore very much. Before placing into the oven, don’t forget to pierce the sweet potatoes (without peeling) several times with a fork or a knife. Otherwise they might explode during baking (and ruin your clean oven!). It takes about 45 – 60 mins to cook (at 200°C / 400°F / Gas 6) depending on the size of your sweet potatoes. If there is no resistance when insert a fork into the centre, it’s fully cooked. Peel off the skin when cold enough to handle, then mash with a fork. If you decide to steam the sweet potatoes, I suggest you peel and cut them into small cubes. This will greatly reduce the cooking time. A pressure cooker or instant pot also is very handy for this task. The dough for classic sesame balls is made of glutinous rice flour, sugar and water. For my sweet potato version of sesame balls, there is no water needed as sweet potatoes naturally contain water. To make 12 sesame balls, I use 260g / 9oz cooked sweet potato and 110g / 4oz glutinous rice flour. Please be aware that the ratio may vary slightly depending on the water content of the sweet potatoes. Add in glutinous rice flour gradually and adjust accordingly. The finished dough should be soft but does not stick to your hands. Depending on your personal taste, you may alter the amount of sugar in the recipe. If you wish, you can skip the sugar altogether. The natural sweetness from sweet potatoes might be enough for those who don’t have a sweet tooth or wish to reduce / avoid their sugar intake. Sesame seed is the soul of Chinese sesame balls. Its powerful fragrance and nuttiness makes this snack super irresistible. Like the peanut & sesame brittle (花生芝麻糖) that I shared earlier, you just can’t stop eating it! Remember to use raw sesame seeds (not toasted) for this recipe otherwise they will be overcooked after deep-frying therefore leaving an unpleasant burning flavour. Here are my three steps to ensure an even, firm coating of sesame seeds over the dough balls (please refer to the video at the end of the post). Mix a little glutinous rice flour with water. Wet the dough ball in the mixture completely. Place the ball in a bowl filled with raw sesame seeds. Shake the bowl in a circular motion to allow the ball to roll around in the seeds. Take the ball out when it’s fully covered with seeds. Press gently with the palm of your hands to firm up the coating. Now it’s time to deep fry the sesame balls. To ensure success, it’s crucial to follow the recommended temperature. I suggest that you use a kitchen thermometer (inexpensive but very handy) if you are not experienced at deep-frying. Heat up the oil over a high heat. Turn it down to medium once the temperature reaches 125°C / 250°F. It’s quite low compare to deep-frying of other food, eg. Chinese doughnut sticks (油条) which requires 180°C / 356°F to start. When placed in the oil, the sesame balls stay at the bottom of the cookware. You can see tiny bubbles gently appear around the balls. I fry 6 balls at a time. It takes about 6 minutes to finish. During the process, you will see the balls slowly rising up. When they reach the surface, push them down from time to time to help achieve an even colour. They are done once you see (between the gaps of the seeds) the dough turns bright orange. If you deep fry the balls in batches like I do, do not cook the second batch straightaway! You need to wait for the oil to cool down to 125°C / 250°F. This is often a neglected point that causes problem. 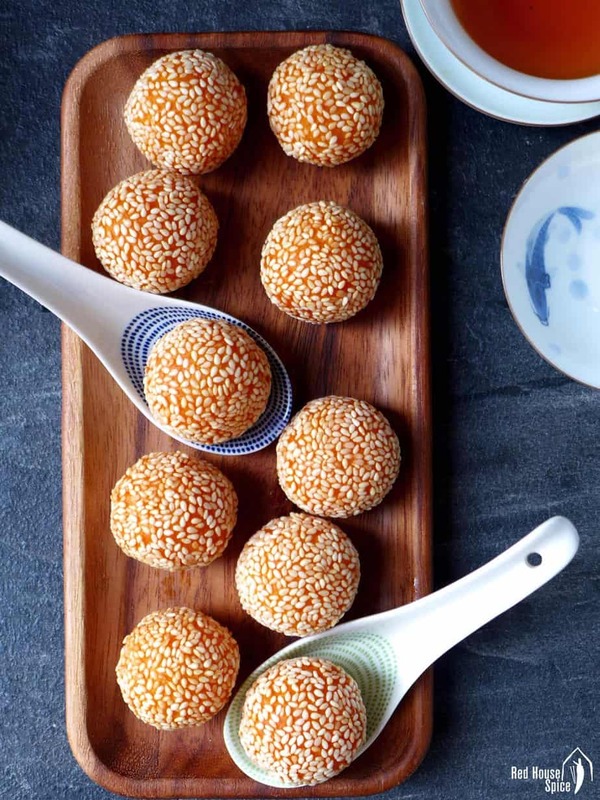 Apart from plain ones, Chinese sesame balls can be filled with sweet filling too. Red bean paste, black sesame paste and peanut paste are popular choices. If you are interested in making some filled sesame balls, check out my recipe post on Tang Yuan (汤圆), Chinese glutinous rice balls. You will find instructions on how to make black sesame paste, as well as how to wrap the filling with the dough (the same method applies to sweet potato dough). Crispy, gooey and super nutty, classic Chinese sesame balls are a delectable treat not to be missed. They taste even better when made from sweet potato. Please refer to the demonstration video above. Cook the sweet potato: Pierce the sweet potato (without peeling) several times with a fork or a knife. Place into a preheated oven and bake at 200°C / 400°F / Gas 6 for 45 - 60 minutes. Peel off the skin when cold enough to handle (see note 3). Make the dough: Mash the sweet potato with a fork until smooth. Gradually add glutinous rice flour and sugar while mixing with a spatular. Combine with hands to form a soft dough (see note 1). Form the balls: Divide the dough into 12 equal parts. Roll each piece into a ball with the palm of your hands. Coat the balls: Mix a tablespoon of glutinous rice flour with 1/2 cup of water. Wet a dough ball thoroughly in the mixture. Then place it in a bowl filled with raw sesame seeds. Shake the bowl in a circular motion to allow the ball to roll around in the seeds. Take the ball out when it’s fully covered with seeds. Press gently with the palm of your hands to firm up the coating. Repeat to coat the rest of the balls. Fry the balls: Heat up the oil over a high heat. When the temperature reaches 125°C / 250°F, turn the heat to medium then gently add the sesame balls. They stay at the bottom of the cookware initially (with tiny bubbles appearing around them). Then slowly rise up. When they reach the surface, push them down from time to time to help achieve an even colour . They are done once the dough (between the gaps of the seeds) turns bright orange. N.B. If you wish to deep fry another batch, make sure you wait for the oil to cool down to 125°C / 250°F. This is often a neglected point that causes problem. 1. The amount of glutinous rice flour may vary depending on the water content of the sweet potato. Adjust accordingly. The finished dough should be soft but does not stick to your hands. 2. 600ml oil is enough when you deep fry in a medium-sized sauce pan. Mine is around 20 cm / 8 inches in diameter and I fry 12 sesame balls in two batches. You might need to increase the volume of the oil if using larger cookware. 3. The baking time required may vary depending on the size of the sweet potato. If there is no resistance when you insert a fork into the centre, it’s fully cooked. Alternatively, you can peel and cut the sweet potato into small cubes. Then steam them for about 15 minutes until they are fork tender. A final tip: It’s best to enjoy sweet potato sesame balls when they are hot. They will lose the lovely crispiness when left for a few hours, but they will still be very tasty! You can store uncooked balls in the freeze for up to a month. Leave to thaw in the fridge then fry them the normal way.